Rezervujte si pobyt ešte dnes! 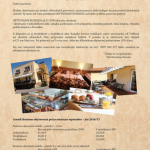 Whether you visit Bojnice for leisure or business, our Guest House is the ideal place for your stay. Just check -in at our place, then head out for whatever your plans. Relax at night after long and eventful day. Enjoy delicious breakfast in the morning and another great day is just ahead. Single, Double and Triple/Family Rooms with en-suite bathrooms close to the town centre. Free private car park, free Wi-Fi. Buffet or Á la carte Breakfast served every morning, lunch and dinner available in a restaurant in the town centre. Discover historic and spa town Bojnice, one of the most attractive tourist spots in Slovakia. Everything is just few minutes away.